Every successful company hits growing pains at some point along the way. One of the most harrowing for IT is the transition from the "build it quick!" startup mindset to the more structured and stable mentality of a mid-stage business. 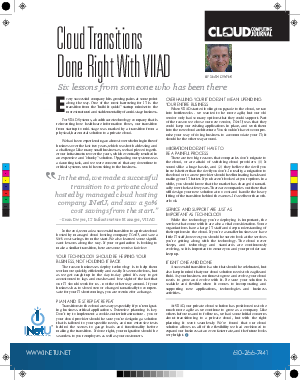 Read this article in Cloud Computing Journal to understand the 6 lessons that technology company VIIAD Systems learned when moving their systems to the cloud and reduced costs by 50% from the start by leveraging a managed services provider. Now with their private cloud, VIIAD is positioned to be much more agile as the company grows.